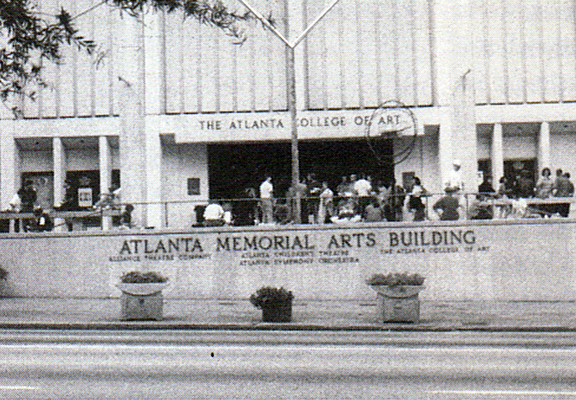 The Atlanta College of Art (ACA), founded in 1905, was a four-year accredited private art college in the city until 2006, when it was absorbed by the Atlanta campus of the Savannah College of Art and Design (SCAD). ACA was located in the Woodruff Arts Center, a multiuse art complex composed of the High Museum of Art, the Alliance Theater, and the Atlanta Symphony Orchestra in midtown Atlanta. In 1905 an art school and museum, later to become the Atlanta College of Art and the High Museum of Art, were formed as an outgrowth of the Atlanta Art Association. The ACA library's holdings included more than 25,000 books, 180 periodicals, and 90,000 slides, as well as a rare books collection and an artists' book collection. The ACA Gallery, located in the Woodruff Arts Center, continues to be open to the public at no charge; ongoing shows rotate between faculty and student, and international, national, regional, and local artists. The Bachelor of Fine Arts degree was offered in twelve specialized disciplines, including communication design, drawing, electronic arts, painting, photography, printmaking, and sculpture. Student activities included internships, volunteer opportunities, clubs, and student government. In fall 2003 there were more than 350 full-time students and more than 75 faculty. This group was created by alumni for alumni, professors, employees, and former donors to the school. This was one of the best experiences of my life, as I am sure it was yours. Let's keep the flame burning!